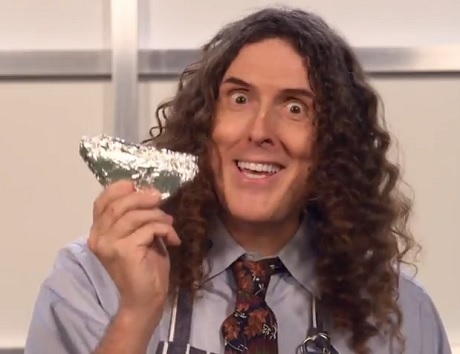 Whether by fighting off mould or mind control, "Weird Al" Yankovic shows us the many uses of aluminum foil in the latest video supporting Mandatory Fun, the Lorde-parodying "Foil." The single starts off subtly, with Yankovic setting his patented adenoidal singing approach against Lorde's snap-heavy pop arrangement to praise the crinkly, food-covering product for protecting his doggie bag wares from the threat of bacteria. The humorist, however, dives deep into the world of conspiracy theories in the second verse, at least up until the point where a couple of mysterious Men in Black types yank him off his TV show set. Featuring cameos from comedian Patton Oswalt and Reno 911 vets Tom Lennon and Robert Ben Garant, you'll find the College Humor-produced video for "Foil" down below.